from a blood sample, and day II was always my favourite, because it was the day I actually got to see DNA. Yes, DNA is unimaginably tiny, but it’s so compressed that once you ‘unroll’ it you can actually see the strands. And call me emotional, but the thing almost got tears to my eyes. Each time. The method we used is called phenol-chloroform, and what it does is basically break apart white blood cells – destroying the cell membranes – to give access to the DNA itself. Leave overnight, add phenol and ethanol and let the magic happen: A simple shake precipitates the DNA, and you can suddenly see, in the middle of your clear tube, a long, semi-untangled chain. If I had to choose a memory of those years it would be this… even when it was all done accompanied by the disgusting smell of chloroform! 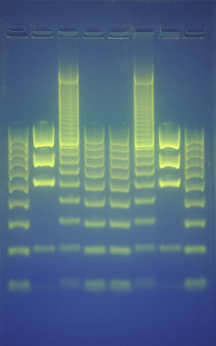 Once we got our DNA CPRed into the fragments we needed, we prepared an agarose gel (comes from agar, seaweed, basically), by microwaving it and giving it a rectangular shape, made little holes in it, inserted the samples and put everything in an electrophoresis tank. The tank uses electric current to pass the DNA samples through the gel, which acts like a sieve allowing smaller DNA molecules to migrate through the gel quicker than larger molecules. After a while (usually a little over an hour), some molecules will have run longer distances than others. This distance was crucial. In my case, it meant a person had a mutation that indicated he/she belonged to a determined genetic family, which I used to study migrations patterns. Because the samples had some dye on them, the result was a beautifully coloured block of gel that you could see under UV light. And this is what I wanted to share here, these amazingly simple lines that represented so much in so little space. Ethidium bromide stained DNA glows orange. It’s absolutely marvellous. Well, happy to write about this stuff, more definitely to come!